The complete list of contributors also includes Alison Littlewood, Cat Rambo, Catriona Ward, Cavan Scott, Genevieve Cogman, George Mann, James Lovegrove, Jane Yolen, Jonathan Green, Juliet Marillier, L.L. McKinney, Laura Mauro, Lilith Saintcrow, M.R. Carey, Mark Chadbourn, Rio Youers, and Robert Shearman. 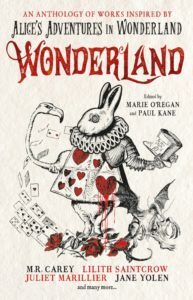 This entry was posted in Uncategorized and tagged alice in wonderland, alison littlewood, and Robert Shearman., angela slatter, cat rambo, Catriona Ward, Cavan Scott, Genevieve Cogman, George Mann, James Lovegrove, Jane Yolen, Jonathan Green, Juliet Marillier, L.L. McKinney, Laura Mauro, Lilith Saintcrow, M.R. Carey, Marie O'Regan, Mark Chadbourn, paul kane, Rio Youers, Titan Books, wonderland. Bookmark the permalink.